Gangman has been in the world headlines since it appeared first awhile ago and every one seemed to be obsessed with it. Even ads had been 'impressed' by the Gangman style and many a ads were seen based on Gangman theme. 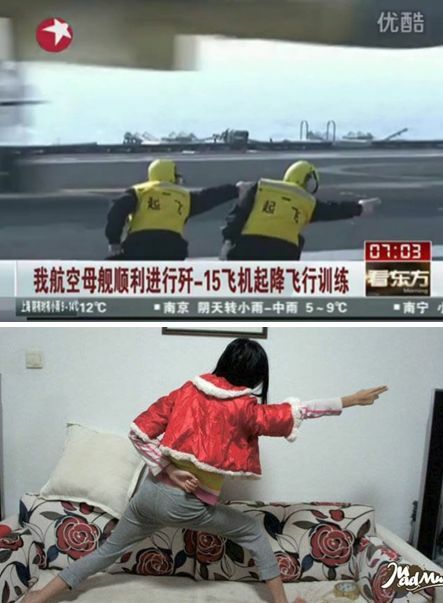 Now it is 'Aircraft Carrier Style' - a Hilarious new internet meme that mimicks Chinese navy personnel. China's web-savvy citizens learned a new move last weekend after watching a news report about fighter jets landing and taking off from the country's first aircraft carrier. They particularly picked up on the funny pose of two aircraft carrier personnel, seen at the 2:37 mark in the video below, who were directing planes on board.